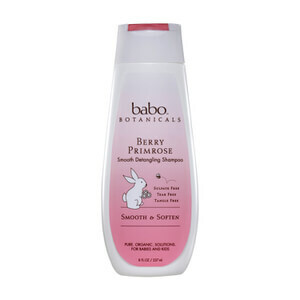 Suitable for babies and children of all ages, the Babo Berry & Primrose Smoothing Conditioner gently softens and detangles unruly hair to eliminate frizz and flyaways without tears. Infused with Evening Primrose Oil, Shea Butter and Babassu Oil, the deeply nourishing formula moisturizes and strengthens your little one's hair to leave it calm, manageable and easier to brush. Its subtle Berry scent leaves hair smelling clean and fresh. Apply to damp hair. Rinse. Detangle. Purified Water (Aqua), Aloe (Aloe Barbadensis) Vera Leaf Juice*, Cetearyl Alcohol, Behentrimonium Chloride, Vegetable Glycerin, Stearylkonium Chloride, Babassu (Orbignya Oleifera) Seed Oil, Glucono Delta Lactone, Isoamyl Laurate, Cetearyl Glucoside, Guar Hydroxypropyltrimonium Chloride, Nutri-Soothe® Herbal Extract Complex [Vegetable Glycerin, Chamomile (Anthemis Nobilis) Flower Extract*, Calendula (Calendula Officinalis) Flower Extract*, Meadowsweet (Spiraea Ulmaria) Flower Extract, Wildcrafted Watercrest (Nasturtium Officinale) Leaf Extract, Kudzu (Pueraria Lobata) Root Extract*], Shea (Butyrospermum Parkii) Butter, Provitamin B5 (D-Panthenol), Glyceryl Stearate, L-Arginine, Currant (Ribes Nigrum) Absolute, Orange (Citrus Aurantium) Oil, Grapefruit (Citrus Grandis) Oil, Sorbitan Olivate, Hydroxypropyl Methylcellulose, Evening Primrose (Enothera Biennis) Oil, Ethyl Lauroyl Arginate Hcl, D-Alpha Tocopherol Acetate, Lactic Acid, Mica, Iron Oxide, Titanium Dioxide, Silica. *Certified Organic Ingredients.